He could have remained at home last Sunday morning, after all there was a storm looming, and the weather was not conducive for outdoor activity. During the service, Henry Providence, a 66-year-old man originally from Questelles in the South Leeward district was informed by the local Police that his humble residence had been buried beneath rocks and rubble. Providence was taken to the scene, and encountered the sight. “All I know and proud about is my life (is) saved,” he told me last Wednesday at the Culture and Tourism Office on the Cruise Ship Berth in Kingstown where he had gone to see Minister Rene Baptiste parliamentary representative for West Kingstown in which Gibson Corner is located. $342, 338.38 as a result of the passage of the storm. When Providence returned home on Sunday, he could hardly believe his eyes. His former abode was now just a crumpled mess. Trees and rocks overhanging the house had succumbed to the rain and the saturated soil had caved in. The rubble engulfed the building and lay sprawled across the road at Gibson corner on the Leeward Highway. The debris blocked the road and members from the constabulary, assisted by patriotic citizens restored the normal flow of traffic. Though Providence had lost all his belongings, that was not a worry to him. “The house gone so far. I ain’t really thinking about that. I feel happy because my life saved!” Providence said. Since the incident, he has been living with his sister Emris Westfield at Gibson Corner, not too far away from Providence’s former residence. “When weather, he does be up here,” Westfield said. She too is happy her brother’s life has been saved. Tropical Storm Earl took its toll on the fragile banana crop Sunday with losses calculated at about $60,000, Disaster Preparedness Coordinator Howie Prince has revealed. Other trees snapped under the force of the winds which, although not sustained, were heavy or persistent enough to inflict some damage. 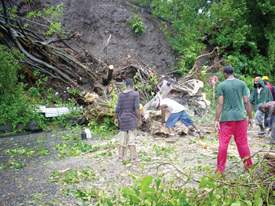 Several persons were affected by the storm and Prince stated that loss of roofs and other damage was inflicted on 14 other houses. A bridge was also affected by the storm while broken embankments contributed to the cost. But Prince is thankful that there was no loss of life. He used the opportunity to encourage persons to continue paying attention to disaster preparedness measures. The nation was mobilized into a state of preparedness from the previous Saturday night with Prime Minister Dr. Ralph Gonsalves on radio advising the nation to heed the warning. Tropical Storm Earl was the third climatic factor to descend on St. Vincent and the Grenadines during August at the start of what seems set to become a very active hurricane season. Tropical Depression Three, which later developed into Hurricane Charley passed early August and affected the banana industry to some extent. That came on the heels of a strong tropical wave, August 4, which dumped over 10 inches of rain in less than 24 hours. The most serious casualty of that onslaught then was the E.T Joshua Airport, which was flooded. Estimated damage from the three weather systems amounted to just over half a million dollars.